Editor’s Note: Following the introduction, please see excerpts from a recent post by Joel Hunter, Ph.D. In his latest post, Honors Education: A Parallel College?, Joel Hunter, Ph.D., continues his response to William Deresiewicz, author of a much read essay at The New Republic and now another at Harper’s. Now, he argues, “Only the commercial purpose now survives as a recognized value. Even the cognitive purpose, which one would think should be the center of a college education, is tolerated only insofar as it contributes to the commercial.” The result, according to Deresiewicz, is that universities ostensibly dedicated to the development of deep critical thinking skills are increasingly functioning as “parallel colleges,” where the true focus is on internships, institutes, entrepreneurship, and vocational disciplines. From “Honors Education: A Parallel College?”, by Joel Hunter, Ph.D. Among the disputed points, Dereciewicz argues that the development of a “parallel curriculum” and “parallel college” is symptomatic of higher education’s abandoning its traditional mission to develop in its students “the ability to think and live” for both personal and public enrichment, and instead reorganizing the function of education around neoliberal aims and purposes. I described in my earlier post why I think this analysis is flawed. In this addendum, I will focus on one example of why we should be hopeful rather than alarmed about some of these “parallel” initiatives: the growth in numbers of and accessibility to public Honors programs and colleges. Honors programs arose in the 1920s and 30s as “Great Books” programs in private colleges. These programs were developed by a group of academics who sought to (re)introduce the liberal arts tradition as the center of American higher education, thus broadening what they viewed as a too-narrow specialization that had emerged in response to the growing economy and culture of industrial scale manufacturing in the late nineteenth century. The growth of the early Honors programs stalled during World War II, the immediate post-war period, and during the Korean War. The launch of Sputnik by the Soviet Union spurred unprecedented federal investment in higher education and reinvigorated the growth of Honors programs. Honors colleges are an even more recent phenomenon. According to the National Collegiate Honors Council NCHC), a survey of their member institutions showed that of those responding, 60 percent of Honors colleges had been established since 1994. And 80 percent of those had evolved from an earlier Honors program. As of May 2015, there were nearly 200 Honors programs and colleges in the U.S. (NCHC guide). The period of this historical development coincides with the very period Deresiewicz claims that neoliberal values appear triumphant. If he were right that higher education has been debased to a mere instrumental good since the 1960s, the rise and growth of these humanistic, interdisciplinary, “Great Ideas” and “Great Books” programs should not have occurred over that same period. Honors programs and colleges express their mission in the very terms that Deresiewicz thinks has all but disappeared in the age of Reagan, Walker, “Third Way” DLC Democrats, and Obama: learning how to think critically and independently, developing an individual’s personal and intellectual welfare, and creating self-governing citizens with a sense of social responsibility, capable of pursuing the common good and sustaining a democratic society. Thriving Honors education at public institutions all over the country – Macaulay at City University of New York, Western Kentucky University, the University of Alabama, the University of Florida, Michigan State University, the University of Cincinnati, UCLA, and the University of Arizona – constitutes a substantial counterexample to Deresiewicz’s dire view of the current and future states of liberal arts education. If a public institution of higher education is committed to serving highly qualified students able to undertake rigorous course work, then the challenge becomes organizing the college under an inclusive conception of honors education. This task consists of three parts: first, to attract and bring together identifiable cohorts of able and ambitious students who commit themselves to the project of becoming educated members of a democratic society; second, to help them understand that they are pursuing an education for life, citizenship, and career, in that order; and third, to create a set of curricular and co-curricular opportunities that can provide such an education, that is, to organize the resources of the university for those students’ benefit. In sum, the honors dean’s job is to provide the campus with cohorts of superb students and to make sure the campus opens its resources to them. Given that this precise effort has been duplicated in dozens and now hundreds of public colleges and universities, a handful of which I listed above, we may well ask how Deresiewicz overlooked the phenomenon of Honors education in his article. For it seems to embody the very values he applauds as a “real” education, a vanguard against neoliberal values and ideology. Perhaps Honors education is insufficiently committed to inclusiveness or egalitarian values insofar as it is confined to a particular population in the university, and for whom the university establishes a “parallel college.” Is Honors education elitist? The answer is, “Could be.” Honors programs and colleges are, by their very nature, selective. They exist in part to enable the academically bright young adults to flourish in a curriculum that often includes Socratic seminars, enrichment opportunities in their disciplinary courses, and access to independent study and projects with faculty eager to engage in “the vigorous intellectual dialogue you get to have with vibrant young minds.” My experience has been that many Honors students “will seek you out to talk about ideas in an open-ended way” and “care deeply about thinking and learning,” just like their most dedicated faculty. Does the selective admissions process for Honors programs and colleges institutionalize systemic elitism? Do such programs create an academic upper class, diverting resources and opportunities away from the lower tier underclass, a 99% left outside the gates of the Honors community? This is a serious concern, especially for public institutions of higher education, who are commissioned to serve all of the citizens of a state and contribute to the commonweal. Can the danger of elitism and exclusivity be avoided or overcome? Let’s consider this objection. An elite enjoys privileges difficult or impossible to obtain by the general population. Having different access to advantages and resources than the masses, elites live and work on an uneven playing field. At a public college or university, if funding and resources are unequally transferred to special cohorts or schools, that appears to be fundamentally at odds with the mission of public institution that exists to serve the public good rather than the private good of particular individuals. The benefits of the education underwritten by the citizens of a state are not (or should not be) prioritized by the good that is served to individuals, but to the common good. Since Honors education is organized in such a way as to benefit a small percentage of the student population, it seems that such programs are illegitimate and inconsistent with public supported higher education. This objection demands an answer. Is it legitimate to divert revenue obtained from one large group of students to benefit a smaller group of students? Yes, sometimes this disproportionate allocation is a legitimate response to serve the overall public good. Funding diversions are recognized and routinely practiced for students with documented disabilities and students for whom English is not their first language. Disability resource centers and intensive English language programs exist to make a college education attainable for all citizens, including those with special needs. Additional services, such as tutoring and accommodations for attending and participating in amateur sports, are provided for athletes. If institutions of public education are obligated to support each individual’s need to fully realize their potential, then differential support from the public treasury is necessary. Are Honors students one of those populations with special needs? Yes, I believe so, and for two reasons. Honors students are comparable to athletes. Competitive amateur sports in college have been recognized for over one hundred years as a means for enabling able and ambitious students to pursue their physical development, which, unless we take a disembodied view of the student, is a legitimate component of their full potential. 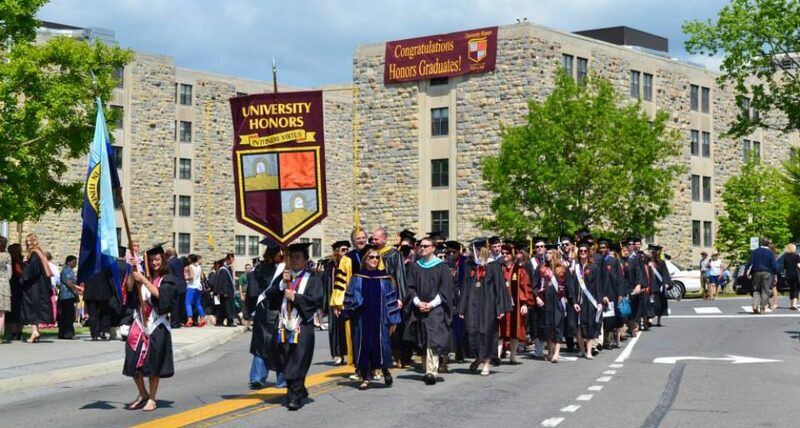 Students admitted into Honors programs are the academic athletes of the college or university. If sport athletes are a population of students who require support to meet their special needs, then Honors students are as well. It is clearly a legitimate special allocation of resources to develop “appropriately conceived and rigorous course work for able and ambitious students.” If the analogy with athletes holds, then able and ambitious students are one of the university’s diverse, special needs populations. The second reason Honors students are a group with special needs in a public institution of higher education is related to the first. The reason institutions of public education are obligated by charter or institutional values to support each individual’s need to fully realize their potential is bound up with the point of education itself. Education refines the individual, nurtures creativity, and contributes to the overall commonweal of the state by the general effect of conviviality encouraged within the institution’s society. By these means public education equips students to contribute more fully and richly to the economic and cultural welfare of civil society. If Honors students are not provided with an appropriate level of course work and academic challenge, the public would be impeding its own economic and cultural development by handicapping some of its brightest citizens from achieving their full potential. Whatever private benefits accrue to students provided with accommodations, and the student with a documented disability, the athlete, and the Honors student all surely do, states have long recognized that legitimate justification for reallocating resources to meet these students’ special needs is the important contribution they make to the public good. 1. Develop and encourage Honors education at all public colleges and universities, including community colleges. 2. Establish broad-based faculty support for Honors education, particularly in institutions with strong professional and technical colleges. 3. Ensure equal access to Honors education by not levying fees or required student expenses over and above those already assessed by the broader institution. Deresiewicz says that the fundamental problem with efforts to push back against neoliberal education “is that we no longer believe in public solutions.” He says “[w]e only believe in market solutions, or at least private-sector solutions.” I do not know who this “we” is, because when I consider the growing movement of public Honors education, I see a strong commitment to a public solution. It may not solve the problems in private higher education, but the residential Honors college developed in public universities has been exported and adapted to some of the most prestigious of private institutions as well. “Real” education, contrary to Deresiesicz’s false alarm, is readily available to all students in this country, in spite of social and political forces that may wish to suppress it.